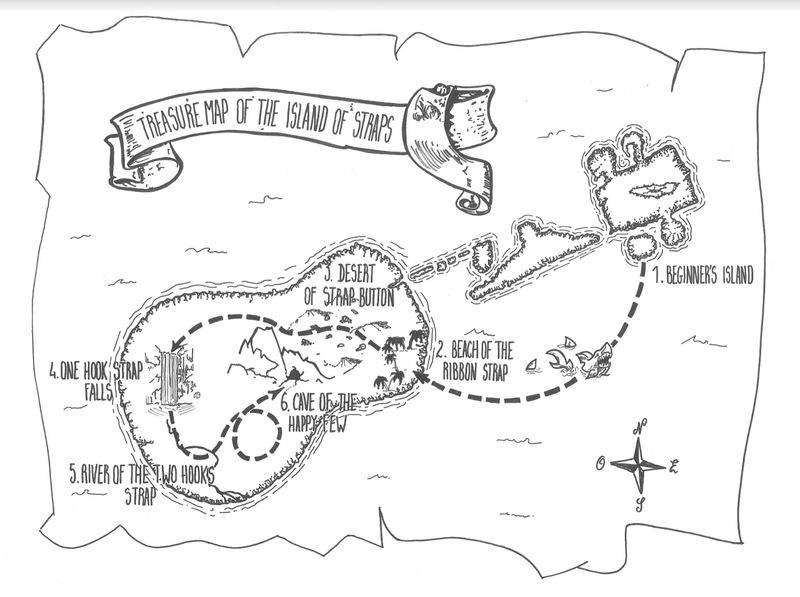 ...So come with me and let's go for a little walk in the Island of Strap. I felt totally alone on the Beginner’s island. 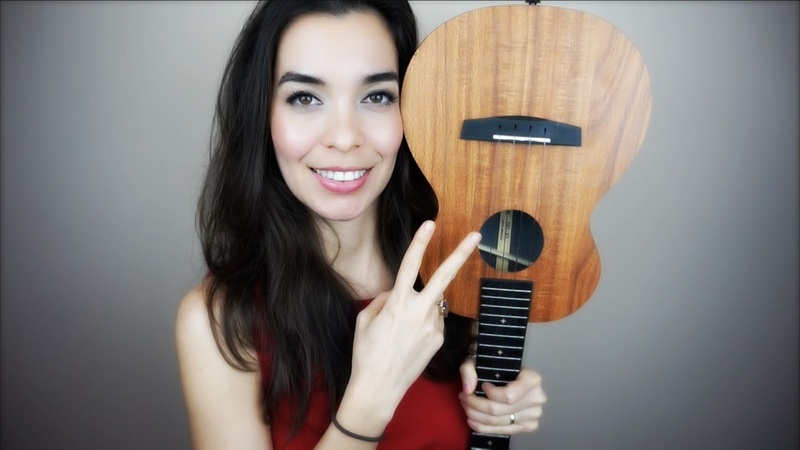 I’ve watched a lot of tutorial about how to hold a ukulele and despite all my efforts I never felt really comfortable. Chords changes and barred chords were too difficult for me and I needed help. I decided to dare sharks and swim to the Beach of the DIY strap. Thanks to Bernie’s help, I made one with a simple ribbon. This was a good solution for me because I can have my hands completely free and my uke stays balanced whatever the movements of my hands. I have to admit it's not very pretty and for sure less stylish than a commercial strap. Trust me, if you’re on a paradisiac island full of clear water and gorgeous landscapes, you want to show off!!! No strap button? No problem. So I wanted to buy a commercial strap. But unfortunately travelled across the Desert of strap button because my two ukes don't have any and for me it's totally out of question to drill them (especially because my new uke has composite material body). Bernadette’s DIY tutorial with sticky hooks is a really great idea but I fear the glue ruin the polish with time, that's why I've never tried. 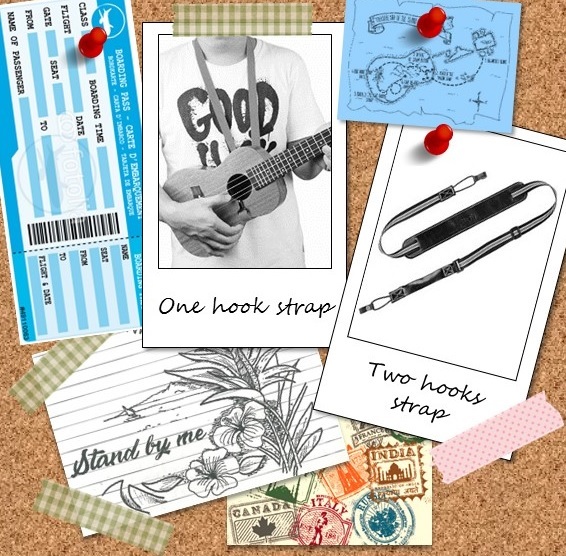 My journey brought me to the One hook strap falls where I could find an item with one hook but it isn't the good solution for me because my uke falls forward when I let go of it and I can't have my hands free. Then the stream of the River of the two hooks strap droped me to a model with two hooks but there's also a problem with this one because the two attached are fixed to the hole of the instrument and the head is too heavy and falls down. I really need my left hand to keep my uke horizontal which doesn't help me to feel comfortable for playing. After a long brainstorming, I finally reached the Cave of the happy few where I understood we only need to adapt the former model to hang it to the head of the instrument. For me it's the best solution to have comfort to play and style to show off without any strap buttons. Hope it will help you as much as the BTM's community does. I don't know if they ship worldwide but anyway there are so many online stores that I’m sure you will find a similar model for a fair price. Normally my model costs 5 euros but there were additional promotions if you picked other items (like stands or tuners) so I could have it for only 3 euros. 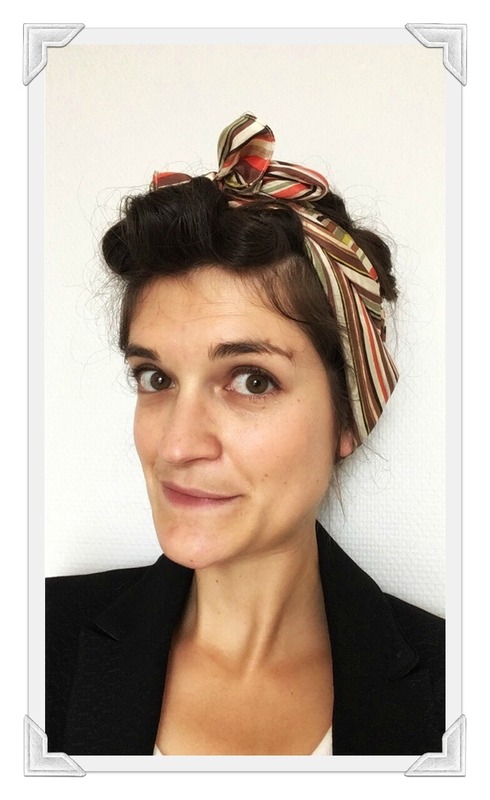 Marion DL is a ukulele enthusiast and cat mommy living in Orléans, France.